Transparency Disclosure: We may receive a fee from the seller for any purchases made through links on this website or from other sites accessed via this website. This fee incurs no additional costs for the buyer. To learn more, please read our full disclosure page here. What is the most traditional type of mattress? Mattresses have developed from the original straw-filled and then feather-filled bags! Innerspring mattresses offer the bounce and support most people wanted. Want a bit of bounce at night – use a spring mattress! Our best innerspring mattress reviews 2019 will help anybody wanting to buy an innerspring mattress to choose the mattress best suited to their needs. Most people have a rough idea of the type of mattress they need, and have decided on an innerspring design rather than a foam mattress. This comparison guide of innerspring mattresses will help you make an informed choice, rather than just a guess! What is an innerspring mattress? What different types on innerspring mattresses are available on the market? How important is the type of coil in the mattress? What are the best brands of such mattresses available online? Here is our opinion of the best innerspring mattresses available in 2019. In addition to the spring type we provide information on the number/type of comfort layers and the overall weight of the mattress. Weight is important for those that want to turn or flip their mattresses – as you should for maximum life. 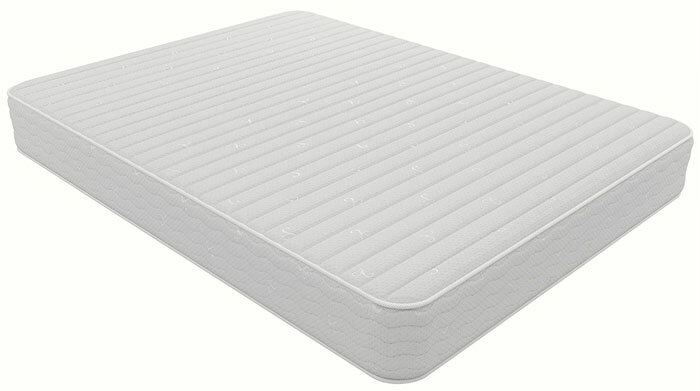 An innerspring mattress is one containing springs rather then just foam. 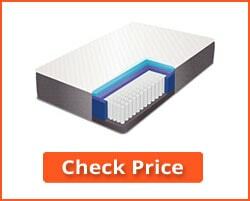 Many types of inner spring mattress also include one or more layers of foam, generally for comfort, although the bulk of the support comes from the springs. While they might not be as popular today as some latex or memory foam mattresses, spring mattresses are still preferred by many people. That can be extremely comfortable if used together with a latex or memory foam topper. However, let’s first have a look at our best Innerspring Mattress Reviews 2019 that provides you with our opinion of the best mattresses of this type. Once we have discussed our top 10 innerspring mattresses, we shall provide you with a Buyer’s Guide that explains the various options and spring types available. The Aviya mattress is a high quality mattress available in various sizes and levels of comfort. The quality of this mattress is reflected in its price, but we have placed it top of our list because it is a truly excellent innerspring mattress with other layers designed to provide various levels of comfort. We are reviewing here the Luxury Firm version, although we will also mention the other options as we proceed. The Aviya Queen-size mattress is constructed using a support base of 800 individually pocketed 8” tall steel springs. This provides a strong base that not only enables each sleeping partner to be isolated from the movement of the other, but also provides individual support for each pressure point in the body. Your shoulders, lower back, hips and knees are all independently supported for maximum comfort and pain reduction if you have arthritis or other joint issues. The innerspring unit is wrapped with 3 inches of foam. This increases the strength of the edges of the mattress, and the overall structure provides superb lumbar support and provides an extremely restful sleep. The soft quilted layer provides extra comfort. 100% 5-star reviews from the 5 users who have so far reviewed this mattress. An excellent combination of pocketed innersprings and foam wrapping. Good support for the lower back and lumbar area in general. Firm but not hard, with a good cushioned top. An excellent option for those who do not like the ‘enveloping’ feel of memory foam. Top quality steel springs that maintain their tension. Option of three firmness levels: Plush, Luxury Firm and Firm. 100 night ‘Sleep Perfect’ guarantee – if you don’t like it after 100 nights, the company takes it back free. 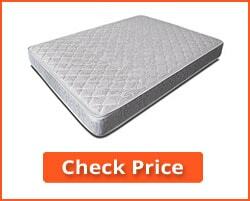 Highest priced of our reviewed mattresses, but worth the money if you like the feel. Otherwise, no obvious negatives. Editor’s Notes: This is a high quality mattress, but by no means the most expensive mattress on the market. 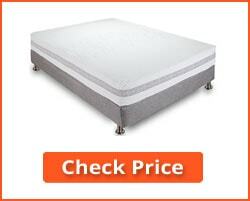 Its structure provides a comfortable mattress in a range of hardness and comfort levels. You have 100 nights to check it out, and you can easily change it to a different level of hardness during that period. In addition to the Luxury Firm version, you can also choose from the Firm and Plush versions. The Signature Sleep Signature 13-inch independently encased coil mattress has a central support layer of independently encased steel coils that is covered all round with a number of cushioned layers. A layer of 3-zone foam forms a soft pillow top that is covered with bamboo rayon ticking material. The pocketed coils and 3-Zone foam work together to ensure true motion separation and equal distribution of your weight over the mattress. This provides a comfortable yet firm base for your pressure points to provide support where it is most needed. The mattress is fire-resistant to Federal Flammability Standard 16 CFR 1633, and CertPUR-US certified to be very low in VOCs, chlorinated hydrocarbons, heavy metals and residual odor. It is constructed using 9.8” 15 gauge encased coil springs round the perimeter for durability, and 9.8” 13.5 gauge encased coils in the center for comfort. 9.8” individually encased coils, with stiffer coils round the edges for strength and durability and softer coils in the center for comfort. Pillow top layer over a high density foam center to provide the most comfortable sleeping surface possible with an innerspring core. Excellent bounce and support for adult activities. The partner separation is excellent. Cannot be flipped because it has a pillow top – but it can be turned so top becomes the bottom. 4% 1-star negative reviews relate to sagging over time and the mattress being too soft. Takes 48 hours after opening to expand to its correct size. Editor’s Notes: The 3-Zone foam referred to comprises a lower high density support foam, a firm center for support to your hips and lower back, and a top pillow foam layer to offer an overall very comfortable mattress to sleep on. The separation of movement between partners is good, and like most innerspring mattresses, it offers good bounce and support for most night-time activities. The Night Therapy 13-inch Euro Box Spring Mattress provides a combination of comfort and customized support. Manufactured by Zinus, this innerspring mattress not only keeps your spine in the correct alignment while sleeping, but it also helps to reduce the transfer of motion between you and your partner. Construction: The core of the Night Therapy Spring mattress comprises 13-inch pocketed springs. As stated, excellent motion separation reducing the likelihood of you being affected by the movement of your partner on the mattress. Pocketed springs that help to ensure the above motion separation because the springs are not attached to their neighbors. The individually pocketed springs provide maximum support to your pressure points. 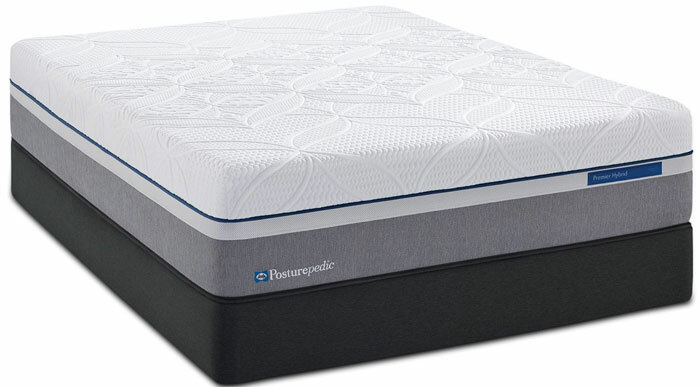 The springs are separated from you with a pressure-relieving comfort foam, and a fiber quilted cover. This ensures maximum comfort along with the support of the innerspring interior. The padding foam used CertiPUR-US Certified. It is a heavy mattress at 113.5 pounds! This may not necessarily be a negative, because the weight indicates that it is substantial and lea likely to lose its support due to frailty. Many of those giving it negative reviews did so because they found it too hard. There have been complaints regarding the smell/odor from the mattress when opened. This is normal for a mattress with a foam topper, although some believed it to be excessive. Only 1-year Warranty and as with all warranties – check the terms. One year seems short for a mattress warranty. Editor’s Notes: Most people who use this mattress find it good for them. There is sometimes an issue with innerspring mattresses with those more used to foam mattresses. The negative reviews relating to hardness may be related to this. If you prefer a mattress that is not too soft, and offering excellent support accompanied with good separation of movement between partners, then is this is ideal for you. Check the terms of the short one-year warranty. This mattress is a hybrid, consisting of an innerspring core with a gel memory foam outer layer. The innerspring core consists of individually pocketed 6-inch steel springs that provide excellent support. Round this is wrapped a layer of gel memory foam that not only provides support for your joints and other pressure points, but also keeps you cool. Neck support is also provided as your shoulders sink into the memory foam and are supported by the pocketed springs, leaving your neck supported by the foam and comfort layer as it should be. The gel absorbs body heat so you do not experience the temperature increases that many do with regular memory foams. The individually pocketed spring coils separates the motion of partner, so you are not disturbed when your partner moves around on the bed. Topping all of this is a quilted layer that adds to your comfort while in bed. Maximum support for joints and pressure points. Your shoulders, hips, lower back and knees properly supported. The cool gel layer absorbs your body heat and keeps you cool while you sleep. Antiallergenic, anti-microbial and resistant to dust mites and molds. 10 year warranty, but check the terms and conditions. Most one-star reviews referred to poor packaging when received. Many found the mattress too soft/plush for them. Editor’s Notes: This mattress has received its position in our best innerspring mattress reviews 2019 list because it combines pocketed springs with memory foam. It should therefore be good for those needing proper support, particularly for their hips, shoulders and neck. Although it is fundamentally an innerspring mattress, some find it too soft, so try it before you buy it if possible. The Beautyrest Recharge Simmons Pillow Top Luxury Firm mattress is around 14 inches thick. It is a multi-layer mattress with a core of individually pocketed coil springs. The springs offer a firm base, while the top layers provide a luxury feel to what is an intrinsically foam mattress with excellent support properties. 2) A 1 inch layer of luxury Airfeel foam that helps keep you cool while sleeping. 3) A 0.5 inch layer of gel foam that provides comfort, and also helps keep you cool by absorbing your body heat. 4) A 0.5 inch layer of Plush comfort foam to add to your comfort. 5) A firm central core of pocketed coils. Comfortable and cooling, with a firm support pocketed spring core. Handles on the mattress to help with easy positional adjustment. Help 800 phone number provided. None reported yet on this new mattress product. Maybe too many layers, although they do tend to work as intended. Editor’s Notes: This mattress would have been placed at #2 in our best innerspring mattress reviews 2019 were it not so new. It has only 3 reviews, and all of them were positive. No reason was given for the 4* review not being 5* – it was positive with no issues reported. This 10” mattress consists of a core of independently encased/pocketed coils to ensure that the motion of each partner in the bed does not affect the other. It is also fitted with a 2.5-inch layer of foam each side to make it truly reversible. 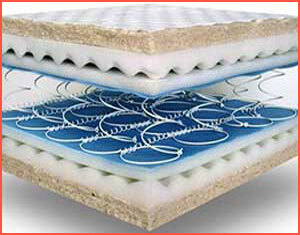 The high-density foam offers extra support and provides a comfortable sleeping surface. The foam ensures that your weight is distributed evenly along the mattress to remove excess pressure on your hips, shoulders and other pressure points. 87% reviewers gave 4-5 stars. The independently pocketed 7.5-inch 15 gauge coils ensure a good separation of the movement of each partner. The mattress is available in a range of sizes, although I reviewed the Queen Size mattress. Low VOC CertiPUR-US certified foam. Comes with a breathable knit fabric mattress cover. The majority of the 5% of 1-star reviews refer to sagging and general loss of shape. Other than the above, there are appear to be few negatives, although that does not indicate that this mattress is better than any of the others reviewed. My listing is based upon the relative properties of each mattress compared to the others rather than only on their individual review ratings. Editor’s Notes: The Signature Contour 10-inch mattress, like those above, is an innerspring mattress that relies on a core of pocketed springs or coils as opposed to interconnected springs. This not only leads to improved comfort, but also more independence for each sleeper. The independently encased coils separate the movement of each partner so that one does not disturb the sleep of the other when they move in bed. This mattress comprises a core of 7.5-inch steel iCoil pocketed springs which, like those above, not only support the contours of your body, but also isolate you from the movements of your partner. Over the springs are two layers of foam: one of a high density foam, and another of a pressure-relieving comfort foam. Together, these three layers offer a strong core with a comfortable top that ensures maximum support with maximum comfort. Like those above, the pocketed springs isolate the movement of each partner sharing the bed. Good plush feel but with a firm core. CertiPUR-US Certified foam ensures minimum VOC emissions, high durability and excellent performance. 10-year warranty – but check the conditions. Negative remarks referred mainly to inconsistency in hardness/softness. Some complain of it being too soft, other of it being too hard. Editor’s Notes: The comfort layers of this mattress could perhaps be slightly thicker, but otherwise it is highly supportive, offering good separation of movement between partners. The 12-inch Mercer Hybrid Gel Memory Foam Innerspring Mattress has a core of steel coil innersprings that are individually wrapped to compress independently. This is ensures that those sleeping on it are not affected by the movement of their partner. 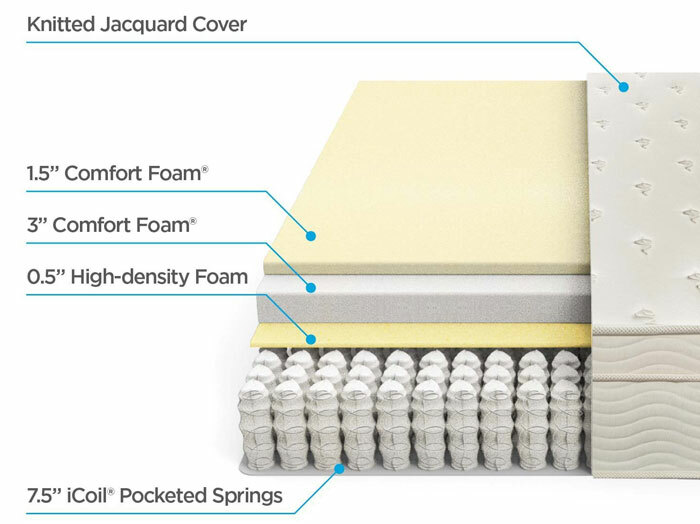 The 5-inches of gel memory foam topping not only provide all the body support benefits of memory foam, but also absorb heat into the gel while you are sleeping. This ensures that you keep cool during the night – or during the day if you work at nights. 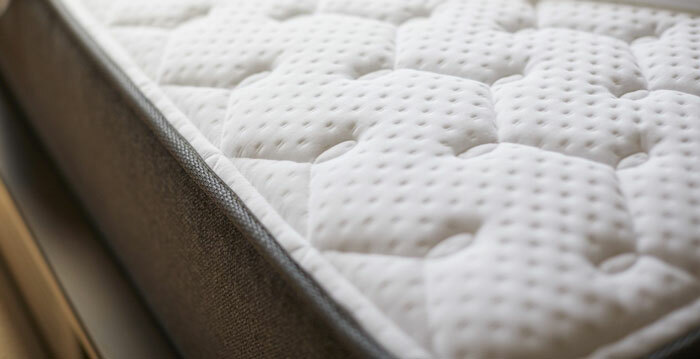 There are two further layers of ¼ inch regular memory foam below that plus an addition ½ inch of memory foam on top of the support innerspring layer to maximize your comfort while sleeping. The whole mattress is covered with a quilted pillow top knit cover that allows that mattress to breathe and to provide a good level of air circulation. This would have been listed higher had its warranty not been so obscure. Proper support of your shoulders, neck, hips, knees and other pressure points that may cause you pain if not properly supported. The gel memory foam keeps you cool during the night. The plush quilted pillow top provides exceptional comfort. The entire mattress package is designed for maximum support, maximum comfort and maximum separation of movement of partners. Uses CertiPUR-US Certified Foam – this means that the foam is free from ozone depleting solvents and has minimum VOCs and their odors. There are the usual mattress complaints regarding lumpiness and sagging over time. Editor’s Notes: When offering a 10-year warranty, a company should provide details of that warranty on every sales site they use. This company does not – but once you have discovered the manufacturing website you can contact the firm’s Customer Service by email or phone. 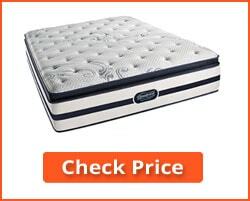 This mattress appears to do what it says, and gets many good reviews along with the few percent that complain about the mattress sagging or becoming lumpy over time. Most love it! This Sealy Posturepedic firm mattress is constructed using a cooling get memory foam top over a pocketed coil support base that provides support for your body shape and pressure areas such as your shoulders and hips. Like the other pocketed spring systems listed above you also get good separation of partner movement that is augmented by the memory foam top. Because this foam contains gel particles that absorb body heat, this mattress also keeps you cool while sleeping. No more waking up sweating. 100% 5-star reviews from only 3 reviews. This mattress includes both gel memory foam and individually wrapped coils for maximum support. The memory foam and pocketed coils ensure excellent separation of the movement of each partner. The center part of the mattress contains more springs and memory foam to provide a more contoured support in the mattress and also improves its durability. A 3.5-inch band of High Density foam round the edge of the mattress to allow a strong seating edge round the mattress. A treated Outlast high-wicking knitted fabric cover that helps to remove even more heat when you are sleeping providing among the coolest possible sleeps available from a mattress. The 100% reviews mentioned above were from only three reviews. This is a new product and therefore has very little comments on it to consider. Nevertheless, it looks like a good mattress and I can find nothing against using it if you prefer a pocketed spring mattress to a 100% foam mattress. It is a firm mattress, and perhaps you may prefer to choose one with more cushioning or a pillow top mattress if you prefer something softer. Editor’s Notes: This mattress will probably figure much higher in future reviews, but for now it is placed where it is due to its relative short history. Once more people have purchased and commented on this Posturepedic Copper Cushion Mattress we will be able to provide more user information to help you. However, for now it seems to be an excellent product, providing practically all you would expect of a high quality innerspring mattress. The Englander Intrigue 7-inch quilted mattress consists of an innerspring base (not pocketed) with a quilted top. It consists of 390 13.5 gauge steel coils designed to provide a long-life mattress. The coils are surrounded by layers of insulation, and are topped with a plush quilted surface that emits no volatile VOCs. It meets the federal flammability standard 16 CFR 1636 and comes with a 1-year warranty. Inexpensive and simple mattress that most find it comfortable to lie on. Plush quilted top and padding around the springs offers a good sleeping surface. VOC- free so no smell when you unpack and unroll the mattress. Low cost below $200 if you are on a budget. A basic mattress with unpocketed springs. Some complain about a lack of comfort – though 70% have been happy with this mattress. Only 1-year warranty which may indicate the expected working lifetime of the mattress. Editor’s Notes: This is basic low-cost mattress for those seeking a guest room mattress or a ‘first’ adult mattress for a child. It is simple, but also comfortable to the majority of those who have purchased it. That may be partially due to the padding and quilted top that are of very good quality, providing a plush feel to the sleeping surface. Commonly referred to as a ‘spring mattress’, an innerspring mattress is one with a base or core comprising of steel springs or coils. 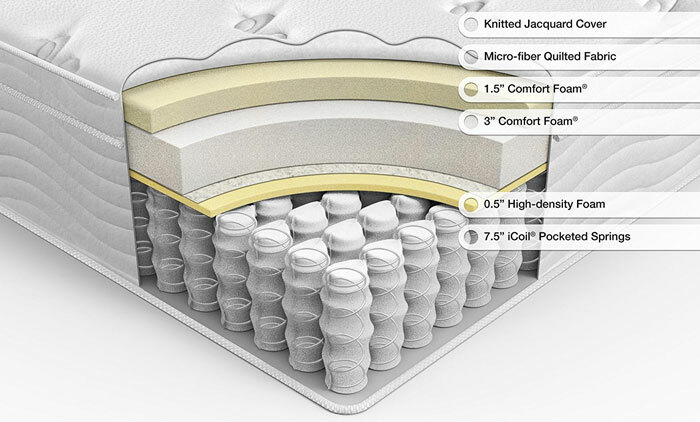 Innerspring mattresses also have at least one comfort layer and a top cover. Open Coils: this type of spring layer consists of numerous individual coils tied together. This arrangement is generally found in less expensive mattresses. Motion isolation or the separation of movement of each partner is low with this type of mattress because compressing even one coil can affect the whole of the mattress. Such mattresses are durable and bouncy, and some people prefer them for these reasons. Continuous Coils: A continuous coil spring is made from long lengths of wire twisted into coil shapes down the length or across the width of the mattress. Isolation of motion is again limited and they can be found in low to medium priced mattresses. Pocketed Coils: With this arrangement, individual coils are held secure in their own fabric pocket. The best mattresses are usually of this type, with hundreds and sometimes thousands of springs compressing independently of each other. This arrangement, also known as ‘encased coils’, offers maximum motion separation and body support, particularly of individual pressure points such as your shoulders, hips and lower back. Other Spring Arrangements: There are other possible arrangements of springs, such as offset coils, where individual springs are hinged together rather than tied, so that individual springs have more independence of movement. There are also patented systems that some manufacturers use only for their own mattresses. Coil Size, Gauge and Count: The gauge of a coil is its thickness, so as would be expected, the thicker the wire the more support it offers. The gauge is referenced by a number, usually between 12 and 18 with low numbers indicating thicker wire than high numbers. A hard mattress would typically contain 12 gauge coils with 15 tending to the soft side. You usually have to request this information since it is not usually provided in advertising. Coil count refers to the number of coils in the mattress. Most stated counts generally refer to a Queen Size mattress, the size I have used for this best mattress review. 500-800 is common, while some higher-end mattress contain up to 2,000 coils. Many spring mattresses are not flippable, but can be turned 180 degrees so the bottom becomes the top, so check that before you purchase. A spring mattress can be uncomfortable to lie on without a comfort layer. The spring layer is the base core of the mattress, while the comfort layer, or layers, provide a comfortable sleeping surface. These are made from a number of different foams: latex, polyurethane, memory foams or gel memory foam that provides a unique cooling effect. Mattress #4, 8 and 9 in our list offer a gel memory foam layer. The mattress cover encases the entire mattress, and can be made from synthetic yarns such as polyester or natural fiber such as wool or bamboo ( #2 Signature 13-inch) – most covers wick away moisture to keep the mattress dry. They are also generally patterned and provide a soft surface. Many have quilted or pillow tops to offer a plusher sleeping surface. Thickness is a matter of preference. Thinner mattresses tend to be firmer than the thicker mattresses, while larger or heavier people will be more comfortable with a thicker mattress of 10” or more. Most innerspring mattresses can be used on any base support, but if you are also purchasing a base for the mattress, then check with the supplier or manufacturer regarding the best type. 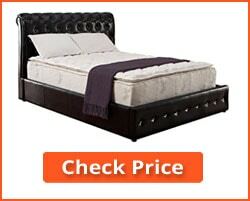 If you purchase a recommended type, then you will have fewer issues if you have problems with the mattress. 1. What is the best type of spring arrangement? Most people prefer the pocketed or encased coil arrangement. This separates the movement of each partner better than any other type of coil arrangement. It also allows better support for those with lower back pain, hip problems and other orthopedic issues. 2. Is the weight of the mattress of any significance? A heavier mattress may offer more stability and a firmer core. Irrespective of that, it is important to note the weight, which is why I have included it in the table. If the mattress is flippable, or if you want to turn it round top to bottom for more even wear, then heavier mattresses will be more difficult to move. Those above range from 39 lb to 113.5 lb – from 3 stones to over a hundredweight! Also, keep in mind that the delivery people may not take it your bedroom! A tip might persuade them though! 3. Will my old mattress be collected? That depends on the company involved. Some will take it away at extra cost, but most will not. Contact the supplier and ask. 4. I have a bad back and need to change my mattress. What is the best type for me to buy? The days are gone when those with back problems had to buy a hard bed. 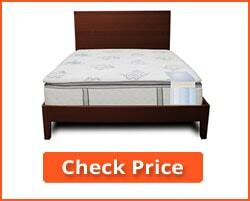 Today, you are best to go for a pocketed spring mattress with a good coil count with a gel memory foam on top. The springs will give you support where you need it, while the gel memory foam will add to that support while also keeping you cool. You are advised to try the mattress first if you can, but if not try a similar one in a local store. I suggest the new Posturepedic mattress, #9. Although it only has 3 reviews, all are 5-star. I will likely rate this much higher in future reviews. You might be best with just a straight memory foam mattress. 5. Will I need to buy a new base for my new mattress? Perhaps, perhaps not! If your existing base is in good condition then it should be OK. If you must buy a new one, check with the mattress supplier for their recommendation. Most existing slatted or solid bases should be fine, and it is unlikely for you to need a new one. Check with the supplier or website if you have a box spring base – some mattresses that need a solid base are not suitable for these. 6. How can I tell if I need a new mattress? Some say every 7-10 years, but you can’t really use its age to determine that because some mattresses last longer than others. Do you find your mattress is becoming lumpy? Does it sag in your normal sleeping position? Can you feel the springs when you lie on it? Do you have aches and pains when you waken up? Do you wake up during the night with backache? Does it look worn? If you can say ‘Yes’ to any of these then you may need a new mattress. More than one, then you likely do need a new mattress. 7. What if I buy a mattress and don’t like it? Before you buy you should check the warranty details. You may have to refer to the manufacturer, although the vendor may have its own policy regarding returns. Some offer a period of time to decide if you want to keep it. One example is our #1 rated Aviya Mattress 100 night ‘Sleep Perfect’ guarantee. If you don’t like it after 100 nights on it, then you can return it. 8. Why should I buy a mattress online rather from my local store? It’s your choice! You certainly get much more choice online, and you also have access to more information about a wider range of mattresses. Online prices can be lower for the same mattress than from a local store, but ultimately, if you get a mattress you like then it makes no difference where you buy it. Many people check it out locally and then buy it from Amazon. 9. What type of mattress is good for my wife and I? We like good bouncibility for obvious reasons. Most young couples like the inherent ‘bounciness’ of traditional open or continuous coils. You can still get this with a pocketed spring arrangement. The #2 (Signature Sleep Signature 13-inch) and #7 (Zinus Sleep Master Ultima Comfort 13 Inch) mattresses offer the strength and bounciness suitable for active young couples. 10. What is the best mattress of all in your list? That will be a choice between three: #1, #5 and #9. The last two are included because they have perfect reviews, but few of them because they are relatively new to the market. I cannot in all honesty rate them higher until more feedback is available, but these three look the best so far. In spite of the growing popularity of memory foam, innerspring mattresses are still preferred by many people. If you enjoy the memory foam experience then many of the innerspring mattresses I have reviewed come with a memory foam comfort or top layer. You can then enjoy the memory foam experience while getting the benefits of an innerspring support. If you are on a tight budget, then that combination tends to be less expensive than a straight memory foam mattress, or even a latex foam mattress of the same thickness. You have a number of options over a wide range of prices. Ultimately, it is what you feel best on that will likely be the best type of mattress for you. Some people check out the various options in a local store before coming to a decision and purchasing online. My Best Innerspring Mattress Reviews are intended as a guide, but an informed guide. Richard has been working in the mattress and bedding sales sector for many years, and he believes that he knows just about all there is to know to help you choose the best possible mattress for your needs. I need Twin XL to accommodate an adjustable base. Which ones work the best.? Also I need a high end base with Massage features and HDMI as well as an illuminated base so could you either do a review of these or recommend a supplier or retailer. InsideBedroom.com is a participant in the Amazon Services LLC Associates Program, an affiliate advertising program designed to provide a means for website owners to earn advertising fees by advertising and linking to Amazon (.com, .co.uk, .ca etc) and any other website that may be affiliated with Amazon Service LLC Associates Program. We are glad you have chosen to leave a comment. You have to agree to the comment policy. Do NOT use keywords in the name field. Let us have a personal and meaningful conversation. Your email address will not be published. © 2019 InsideBedroom. Some Rights Reserved. All trademarks are the property of their respective owners.